Background: Stress classically describes a destructive notion that can have a bearing on one's physical and mental health. It may also add to an increased propensity to periodontal disease. Aim: To investigate the association between psychological stress and serum cortisol levels in patients with chronic periodontitis. Materials and Methods: Forty subjects were recruited from the outpatient department at the Department of Periodontics, from a college in Mangalore, divided into two groups, i.e., twenty as healthy controls and twenty were stressed subjects with chronic periodontitis. The clinical examination included the assessment of probing pocket depth, clinical attachment level and oral hygiene index-simplified. Serum cortisol levels were estimated biochemically using the enzyme-linked immunosorbent assay method and the estimation of psychological stress was done by a questionnaire. Results: Descriptive statistics such as mean and standard deviation was used to review the collected data. Independent sample t-test was used for comparison and correlation was evaluation using Pearson's correlation test. 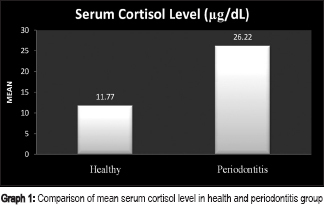 As per our observation, high serum cortisol levels and psychological stress are positively linked with chronic periodontitis establishing a risk profile showing a significant correlation (P < 0.05). Conclusion: Routine serum cortisol assessment may be a reasonable and a valuable investigative indicator to rule out stress in periodontitis patients as it should be considered as an imperative risk factor for periodontal disease. Chronic periodontitis is an infectious disease caused by Gram-negative bacteria which leads to the inflammation of the tissues supporting the teeth, continous attachment loss, and bone loss. It is usually considered to be a gradually progressing disease. Although with the existence of systemic or environmental factors that may alter the host response to plaque build-ups, such as diabetes, smoking or stress, disease development may become more violent. Periodontal disease is multifactorial with multifarious relations between bacteria and host responses which is often customized by behavioral factors. Stress is also a contributing feature in periodontal disease. Moreover, the word stress has an accurate physiological definition, i.e., it is a state of physiological and psychological strain caused by an adverse stimuli, physical, mental or emotional, internal or external that tends to perturb the functioning of an organism and which an organism naturally tries to circumvent. Thus, “stress” can be described as a process with both physiological and psychological components. The role of stress in periodontitis has a conceivable pathological concept. This is because stress can cause behavior variation and increase at-risk behaviors such as smoking, alcohol abuse, and improper oral hygiene due to reduced compliance with dental care as well as some immunosuppressive effects. The sympathetic nervous system via the release of adrenaline and noradrenaline. Cortisol is a steroid hormone produced by the adrenal gland. It is the key hormone in stress and fight or flight response. It is a well-established stress biomarker and is controlled by adrenocorticotropic hormone from the pituitary gland. Its levels can be affected by physical stress, emotional stress, and illness. In case of high level of stress, serum cortisol value is bound to increase, thus it is a reliable indicator in patients undergoing stressful events in life. With this background, the goal of this study was to assess and compare the association between psychological stress and serum cortisol levels of healthy individuals and patients with chronic periodontitis. To compare and correlate the association between psychological stress and serum cortisol levels of healthy individuals and patients with chronic periodontitis. Group II - Twenty stressed subjects with chronic periodontitis. The sample size was calculated with expected parameter (cortisol levels) estimate based on minimum 20% ratio of differences between control and test group. The minimum sample size thus required was required to be approximately forty within a 95% confidence and power of 80% with level of significance as P > 0.05.
α - Level of significance; Sp2 - Pooled variance; 1 – β - Power; μ d - Clinical significant difference. Subjects who have scored twenty points or higher (Group II) on the Perceived Stress Scale by Cohen et al., as this score indicates high stress in a subject. Patients who smoke and consume alcohol. Evaluation of stress by the subject on five-point scale was recorded, and stress level was evaluated for each patient using Perceived Stress Scale by Cohen et al. 1983. 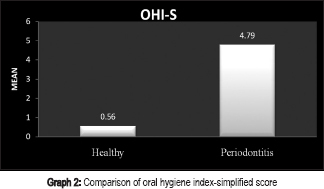 Oral hygiene index-simplified (OHI-S) was recorded for each subject. Estimation of cortisol in serum: Blood was centrifuged and then, serum cortisol level was evaluated using Cortisol ELISA Kit. Descriptive statistics such as mean and standard deviation was utilized to condense the collected data. Independent sample t-test was used to compare the difference in mean of OHI-S and serum cortisol levels between Group I and II [Table 1]. To study the correlation between serum cortisol levels and PD, CAL, Pearson's correlation coefficient was obtained (R value) [Table 2]. If P < 0.05, then it was considered statistically significant. The study included forty subjects divided into two groups, Group I constituted healthy individuals, whereas Group II included stressed subjects with chronic periodontitis. OHI-S and serum cortisol levels of all these subjects were calculated which were compared using independent sample t-test. Results are described in [Table 1]. Investigations promoting the recognition of risk factors are acquiring essence for management and prevention for periodontitis as it is a multifactorial disease. It is recommended that stress, depression, and unsuccessful coping may add to the progression of periodontitis. The periodontal breakdown is promoted, as persistent stress may tend to have a total destructive effect on the immunological response of body leading to an disparity between host response and pathogens. The aim of the present study was to evaluate the association between psychological stress and serum cortisol levels in patients with chronic periodontitis. The results of this study specify increased mean serum cortisol levels in Group II as compared to Group I [Graph 1] and [Table 1]. This indicates that serum cortisol is increased in stressed individuals with chronic periodontitis. These results are in agreement with other similar studies where a noteworthy correlation was found between psychological stress, serum cortisol levels, and periodontal clinical parameters.,, This can be explained as stress-induced response transfers to the HPA axis and promotes the release of corticotropin-releasing hormone from the pituitary gland and glucocorticoid hormones from the adrenal cortex. When cortisol is released into the circulation, it leads to unsolicited effects throughout the body such as modification of certain growth factor levels, elevation of blood glucose levels, and containment of the inflammatory response. 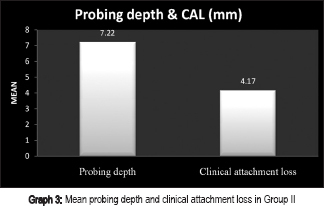 [Table 3] depicts mean probing depth and clinical attachment loss in Group II subjects. In the inter-group comparison, assessing the correlation between serum cortisol level and periodontal parameters, i.e. CAL and PD [Table 2], there was a statistically significant (P < 0.05) and positive correlation between psychological stress and patients suffering from chronic periodontitis. This can be explained by the biologic model suggesting that increased level of steroids results in decreased resistance to infection by suppressing IgA, causing immunosuppression due to which initial colonization of periodontal pathogens is favored thereby leading to an increase in the severity of disease. Within the scope of this study, it can be concluded that high serum cortisol levels and psychological stress are positively associated with chronic periodontitis establishing a risk profile. Stress among the women population was not satisfactorily determined as this study had few female participants. Other manifestations such as recurrent aphthous ulcers, bruxism, lichen planus, oral submucous fibrosis, and deleterious habits such as smoking and tobacco chewing can also be linked with stress along with periodontal disease, but such patients were barred from the study. Lastly, this study included subjects only from low socio-economic background, hence there could be a reasonable likelihood of bias. It can be concluded that there is an affirmative relation between stress, serum cortisol, and chronic periodontitis within the precincts of this study. Hence, for evaluating the risk of chronic periodontitis, assessing patients for stress is an essential factor. However, further research is needed including larger sample size and taking other factors such as smoking, alcohol consumption, and financial strain into consideration to verify the impact of stress on periodontal disease. Financial assistance for this study was provided by NITTE University, Mangalore. Rai B, Kaur J, Anand SC, Jacobs R. Salivary stress markers, stress, and periodontitis: A pilot study. J Periodontol 2011;82:287-92. Haririan H, Bertl K, Laky M, Rausch WD, Böttcher M, Matejka M, et al. Salivary and serum chromogranin A and α-amylase in periodontal health and disease. J Periodontol 2012;83:1314-21. Mahendra L, Austin RD, Kumar SS, Mahendra J, Felix AJ. Relationship between psychological stress, serum cortisol, expression of MMP-1 and chronic periodontitis in male police personnel. Int J Sci Eng Res 2012;3:2-5. 1999 International International Workshop for a Classification of Periodontal Diseases and Conditions. Papers. Oak Brook, Illinois, October 30-November 2, 1999. Ann Periodontol 1999;4:i, 1-112. Cohen S, Kessler RC, Underwood Gordon L. Strategies for measuring stress in studies of psychiatric and physical disorders.A Guide for Health and Social Scientists. New York: Oxford University Press; 1995. p. 3-26. Green LW, Tryon WW, Marks B, Huryn J. Periodontal disease as a function of life events stress. J Human Stress 1986;12:32-6. Elter JR, Beck JD, Slade GD, Offenbacher S. Etiologic models for incident periodontal attachment loss in older adults. J Clin Periodontol 1999;26:113-23. Vered Y, Soskolne V, Zini A, Livny A, Sgan-Cohen HD. Psychological distress and social support are determinants of changing oral health status among an immigrant population from Ethiopia. Community Dent Oral Epidemiol 2011;39:145-53. Jalaleddin H, Kakaei S, Hamissi H. Psychological stress and periodontal disease. Pak Oral Dent J 2010;30:464-7. Ishisaka A, Ansai T, Soh I, Inenaga K, Awano S, Yoshida A, et al. Association of cortisol and dehydroepiandrosterone sulphate levels in serum with periodontal status in older Japanese adults. J Clin Periodontol 2008;35:853-61. Dolic M, Bailer J, Staehle HJ, Eickholz P. Psychosocial factors as risk indicators of periodontitis. J Clin Periodontol 2005;32:1134-40. Pai KK, Nayak SU. Stressing the stress in periodontal disease. J Pharm Biomed Sci 2013;26:345-8. Miller DB, O'Callaghan JP. Neuroendocrine aspects of the response to stress. Metabolism 2002;51 6 Suppl 1:5-10. Monteiro da Silva AM, Newman HN, Oakley DA, O'Leary R. Psychosocial factors, dental plaque levels and smoking in periodontitis patients. J Clin Periodontol 1998;25:517-23.